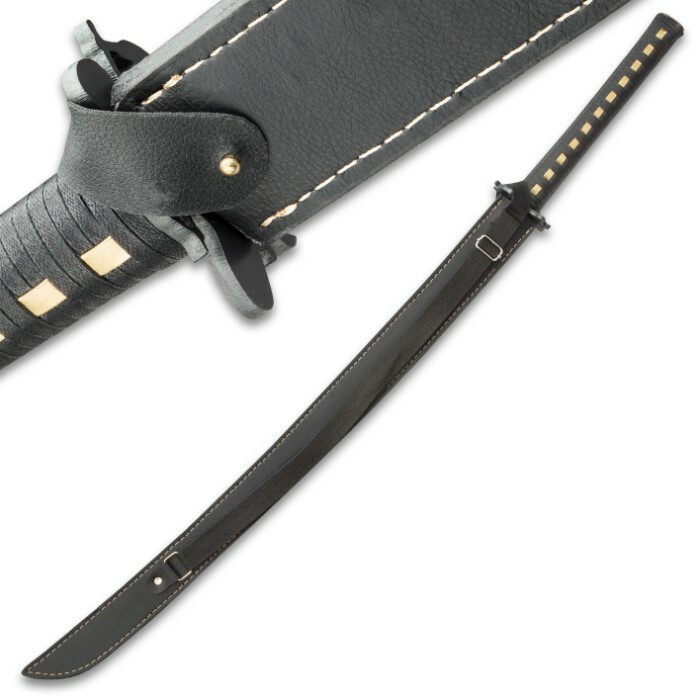 Kojiro Knight Terror Ninja Katana / Samurai Sword - 1065 Carbon Steel - Black Genuine Leather; Iron Tsuba - Leather Shoulder Scabbard - Full Tang, Tactical, Functional, Battle Ready - 39 1/2"
Embrace the night and be the "knight" - the ghost in the shadows, the "terror" in the darkness. With Kojiro's Knight Terror Ninja Sword slung on your back, the night itself trembles with fear. But as for your foes, they neither shudder nor resist. Your alluringly black Knight Terror Sword fuses with the night itself. Your enemies never even see you coming, much less react. Fully functional, functionally tactical and just plain "fun" Shedding fanciful garb like ray skin same and intricately adorned saya, the Knight Terror is no mere showpiece, best relegated to a display stand or wall mount. Its sleek, tactical-centric design combined with slimline leather shoulder scabbard makes the Knight Terror quick to brandish, extraordinarily responsive and effortless to control. 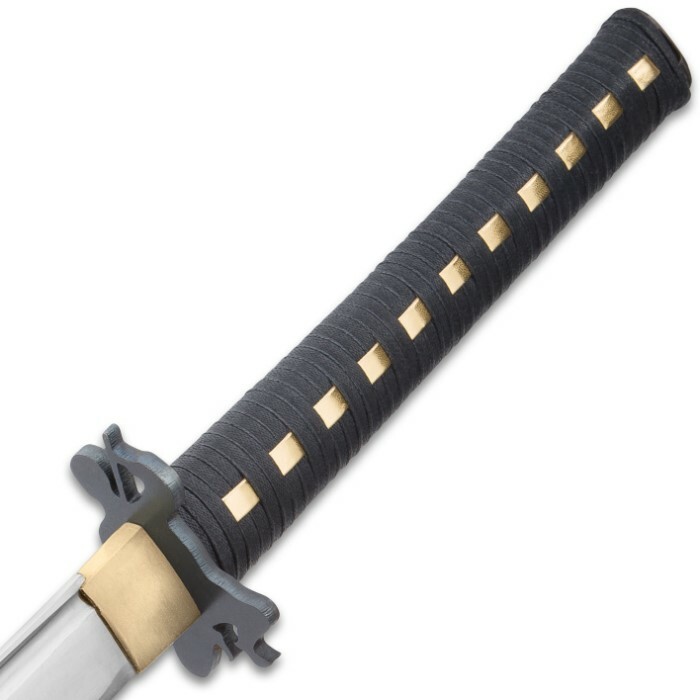 Simply put, it's nigh impossible to put the Knight Terror away once you grasp its rugged, black leather thong-wrapped tsuka for the first time, as wielding this distinctive ninja sword is an experience you'll never want to conclude. Serious, "real-world" sword, it may be, but that's not to say the Knight Terror is altogether devoid of frills and beauty. On the contrary, this black menace is teeming with subtle beauty and dark, "ancient assassin" allure. In addition to providing a sweet, no-slip grip, the tough leather thong that encircles the handle adds rugged mystique and wicked style. Brass-finished cast metal accents offset the leather's inky black hue, which continues onto the eye-catching, undeniably one-of-a-kind tsuba. Flawlessly cast from iron like so many swords of centuries past, the tsuba is shaped in the unmistakable silhouette of an ancient Japanese ninja, seated in the classic meditative pose, wielding a long, slender bo staff. It's just one example of many that showcases the Knight Terror's impeccable bent for adding a touch of unique tactical flair to even the most utilitarian features. But as with all swords, the heart, soul, teeth and claws of the Knight Terror is the blade. 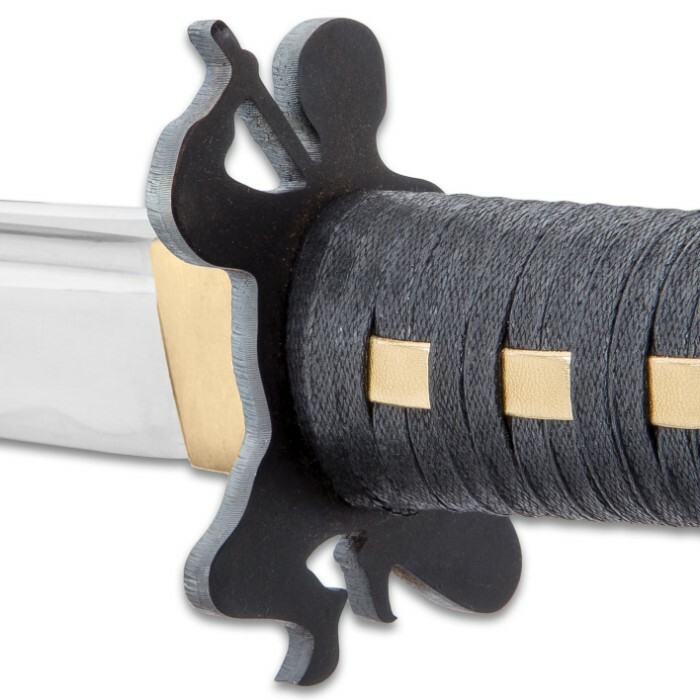 Formidable and bold, the gracefully curved tanto blade is hand forged from quality 1065 high carbon steel. The edge is carefully honed to razor sharp and embellished with a classic hamon. Distinctly up-swept, the intense tanto point is a force to be reckoned with all on its own, boasting a bitter sting and tremendous penetration power. When forcefully thrust, the sinister point, or "kissaki," can pierce, puncture and permeate almost any material. The Knight Terror blade as a whole makes quick work of the even the most punishing, difficult cutting jobs, bolstered by its rock-solid full tang construction. 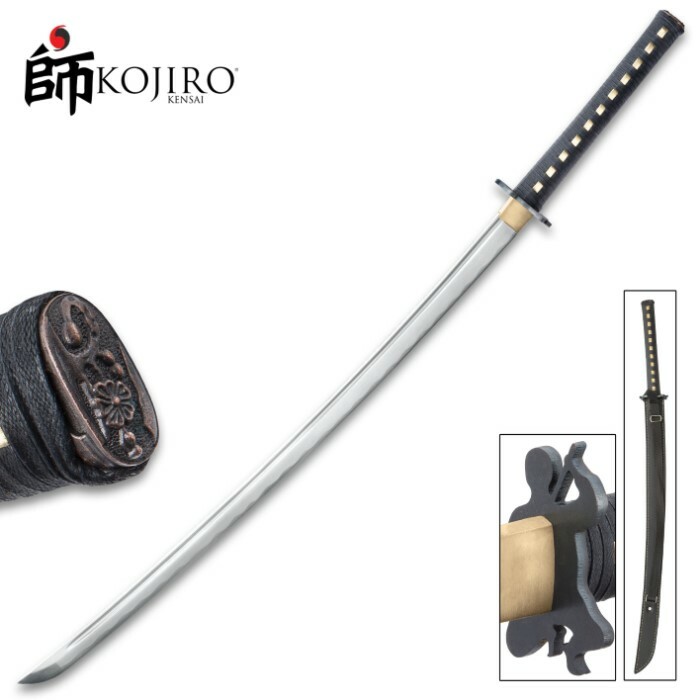 If you're a bona fide ninja assassin or old-school mercenary-for-hire, Kojiro's Knight Terror Sword fits the blood-soaked bill and proves invaluable in the field. For the rest of us - avid sword collectors, martial artists, Eastern culture/weaponry enthusiasts and more - the Knight Terror is just as vital. Add a touch of cryptic ninja style to any space, and mount it on the wall - as long as you can stand it, anyway. Whether slashing traditional rolled tatami mats, splitting water bottles, cleaving bamboo or challenging the Knight Terror to any other "tameshigiri" - i.e., traditional Japanese cutting test - upon making that inaugural cut, you won't be able to leave this incredible, downright fun-to-wield sword in its sheath, much less on the wall, for long. I got two these BOGO, sharp out of the box and good balance. Couple of light strokes with a fine hone perfected the blade. This sword is unbelievable quality for a budget. I feel bad for only giving it 5 stars. The balance is proper and not a welded tang or unbalanced, the handle is comfortable and easy to use, and the tsuba is actually beautiful. The artistry and finish work could be better but I live by the philosophy of form following function and this sword is made to function. It feels excellent and has a proper blade and the sheath is surprisingly well made. I can not think of any other sword that approaches this katana. If you are debating buying this-do it! I expected to be disappointed but I am more than satisfied. This is worth the money and then some.